When I started developing MyTrails, in-app purchases (IAP) were not available on the Play Store, so like all apps from that generation, a tiny app (MyTrails Pro License) served to indicate to the main app that the user had purchased the Pro version. It worked, for the most part, but some users didn’t know that they could just download the Pro license again for free when they switched to a new device. So now MyTrails is available as an IAP. Buying it is slightly easier and the minor support burden should be a thing of the past. I also wanted for users who have both a Google device and a Kindle to not have to purchase the Pro version twice just because of the platform divide, so the license information is stored on my server, and it is attached to your FrogSparks account. On Google devices, the FrogSparks account is superseded by using your Google account; on Amazon devices the FrogSparks account remains. If you already have a FrogSparks account (or you also use a Kindle), both accounts can be attached by first connecting to your FrogSparks account, then your Google account, from your Google device. All this happens in MyTrails > Preferences > Accounts > FrogSparks. If you already have purchased the Pro license, MyTrails will first prompt you to create or connect to your account, and will transfer the license to the server, after which you will be prompted to uninstall the Pro License (but you don’t have to). The Pro License application will remain available on Google Play for the time being, but should no longer be used. tl;dr: If you want MyTrails Pro, from now on the IAP is the way to go, MyTrails will guide you. This entry was posted in Blog, FAQ, Purchases and tagged pro on 29 November 2013 by frogsparks. 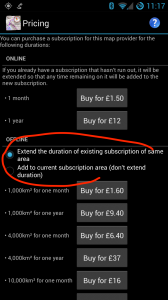 Can I extend the size (rather than the duration) of an offline subscription to a premium map? You can extend the duration and/or extend the volume by purchasing another subscription within MyTrails. 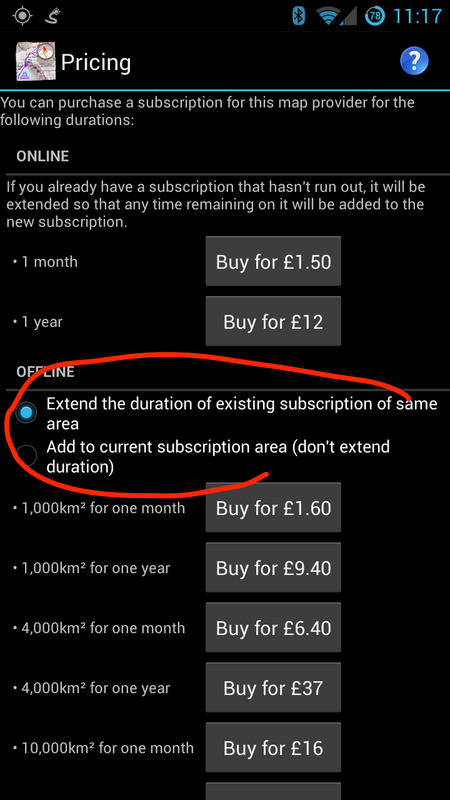 When you purchase another subscription, if it is the same “size” as a current subscription, it by default extends the duration, but you can select the option to add to the current subscription area instead. Purchasing a subscription of a different size always adds to the area rather than extend the time. This entry was posted in FAQ, Purchases on 10 June 2013 by frogsparks. Can I only subscribe to (not own) premium maps? MyTrails lets you freely define the locations you download offline, so you don’t have to select a particular map number or administrative division when you purchase a map. Also, when you no longer need to have a given map offline, you can remove it and download another map without any additional cost (like a map lending library), so you don’t have to pay for a very big subscription, only what you need to have access to simultaneously. This flexibility does mean that we can’t offer perpetual licenses (similar to owning, but in the digital world actual ownership is getting scarce). This entry was posted in FAQ, Purchases and tagged maps, premium on 10 June 2013 by frogsparks. I deleted a premium map from my phone, how do I get the credits back? 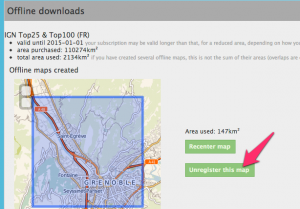 Most premium maps sold via MyTrails are priced according to how much of the map you wish to store on your device. Within that limit, you can download the parts of the map you wish, and when you no longer need a given area, you can delete it and download a different area. Because MyTrails allows you to use the map on different devices, just deleting the map on one device is not enough, the map needs to be unregistered on the server. When you try to delete a an offline map you have created from a premium map, MyTrails asks whether you want to just delete the map locally (presumably it can still be used on another device) or also unregister it. You only get the download credits back if you unregister the map. Even then, you may not get back the exact amount of credits corresponding to the area of the offline map you unregister: MyTrails keeps track of the area of all your offline maps, and computes the total area, excluding overlaps (the area of the union of your maps), which means that if the map you unregister overlaps another map, the overlapping area will not be refunded. What happens if you make a mistake and omit to unregister it? You need to use our server to unregister it. if you do not yet have a FrogSparks account, create one from your device: MyTrails > Preferences > Accounts > FrogSparks > Register, which will associate the maps you have purchased from your device with your account. from your device or a computer, go to our self-administration server. once you’ve logged in, you’ll see the list of offline maps you have created, and you can unregister the map. This entry was posted in FAQ, Purchases on 12 December 2012 by frogsparks. In some circumstances, MyTrails may be unable to verify the Pro license, and it displays an error dialog claiming that the license is outdated and needs to be updated from Android Market (Play Store). Until the license can be verified, Pro functionality will be disabled, which is usually very annoying. If none of the above has the desired effect, please contact our support. MyTrails 1.2.38 with the Pro license 1.0.4 should keep this kind of issues to a minimum, and the time constraints have been relaxed as much as possible. This entry was posted in FAQ, Purchases on 23 April 2012 by frogsparks.